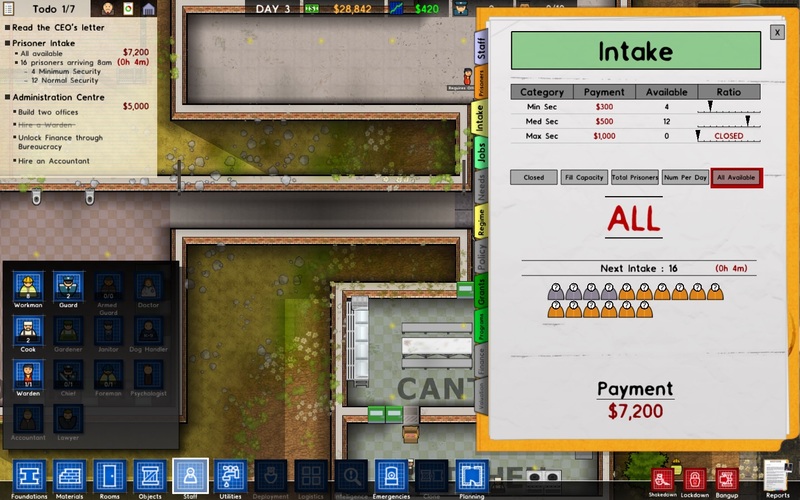 When my other half pointed out that there was a computer game where you could run your own prison, he probably didn’t think I would actually play it. After all, I spend enough of my free time (and his!) thinking and talking about convicts. Nevertheless, it struck me that a computer game might be a good way ‘in’ to the perspective of prison management. In my work on carceral islands in colonial Australia, I have found it difficult not to demonise the brutal superintendents, and feel sympathy for those who allowed a little latitude into the prison regime for the benefit of the prisoners. Over time I realized that superintendents didn’t exist in a bubble – their actions are only relevant in the context of the orders from above, the politics of the time and the great personal strain involved in managing large numbers of staff and inmates. What follows are some reflections on playing the game from my own perspective as a historian of convicts and prisons. I started doing what accompanies every penal establishment I’ve come across in the archives – deforesting the surrounding area and selling the timber for money. I was pleased that my workers were ‘free’, not convicts drafted in to build their own prisons as they did in colonial Australia. Then again, my digital workers worked round the clock, with no rest (and very low energy read outs), so I ended up feeling they represented a rather “un-free” workforce anyway. With T-21 hours till the arrival of my first batch of prisoners, I needed to acquire finances to build the prison. The funding came from government contracts that had certain stipulations – whether to create a more secure prison (build a certain number of solitary cells; hire more guards etc.) or to construct a prison that would improve prisoners’ lives (build a family room for prisoners’ with babies, hire doctors and counselors etc.). 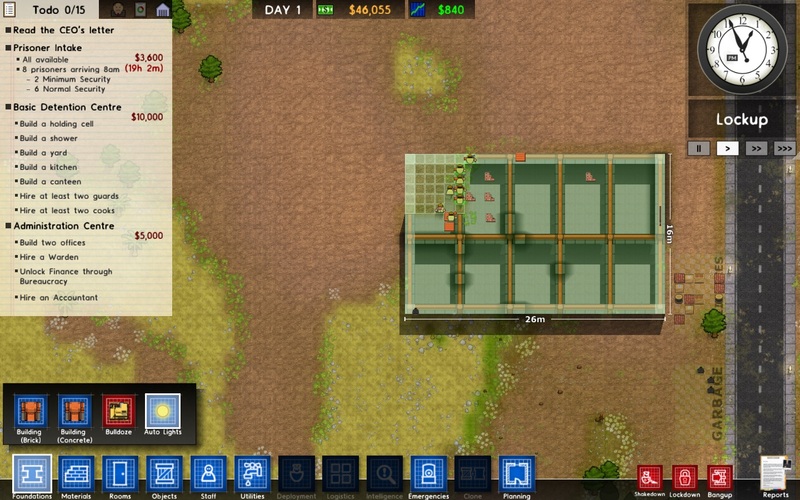 I opted to try and construct a prison that would help prisoners, within the constraints of the game (and within the constraints of the prison system itself). Either set of objectives saw prison architecture as the basis for these kinds of changes to the prison regime (an accidentally Foucauldian perspective). Yet, the game was remarkably unaware of the importance of ventilation, light and minimum size requirements (all well-established by the 19th century), demanding primarily the inclusion of furniture to equate to functionality of the room. Perhaps, this is a logical result of a ‘top-down’ playing perspective, where the walls are lateral lines, rather than vertical blockades. Suffice it to say, that notwithstanding a knowledge of both radial and barracks prison design – my prison grew up rather haphazardly, – with a vague desire to have “good” places (for family visits; leisure time; yard time) on one side of the site and “bad” places (prison cells) on the other – mirroring my mixed feelings about playing a game for ‘leisure’ to create a punitive institution. The perspective the game took towards the convicts was an interesting combination of personal and impersonal. On the one hand the prisoners all had name tags hanging off them (named after the KickStarter donators – those who’d donated generously had their face put on a convict, a dubious honour). The digital inmates also had little thought bubbles that popped up (a picture of a family with people surrounded by a heart was surprisingly poignant). At one point in the game, a phone icon flashed up to alert me to a particular inmate’s family history – she had had a child with an ex-husband, who she had brought into prison after committing a murder; it even had the dates of birth of all her family members. 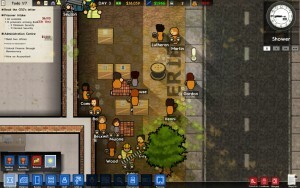 It was a little disheartening to see violent crimes disproportionately represented in the imaginary prison register particularly considering I had chosen to accept mostly minimum-security prisoners (I couldn’t bear to build either build solitary cells or the electric chair – which are both possible within the game). Nevertheless there was a greater sense of personality among the inmates than the staff: who were nameless, and just had a ‘tiredness’ bar attached to them. The only staff member with any personality was the superintendent – you could choose Ruthless Rita (who reduces risk of riots by inducing fear); a military man named Periwinkle (whose judicious use of guard dogs prevented escape) and Saphara (who made underhand deals for profit). The game’s recognition of the complexity of Superintendent’s actions – influenced both by external policy demands, and influenced by his/her own personalities and proclivities was impressive. Then again, I haven’t played any other superintendents to see if it makes much difference to the feel of the game (I opted for the ‘Pacifier’ who calmed everyone just be his presence). On the whole playing Prison Architect brought new perspectives on my own research, in a highly visual and dynamic way. In many ways the rigid outcomes of a computer programme are well suited to the basic issues faced when incarcerating people in this manner (how do we clothe, feed, wash and keep these people secure are the primary issues; the secondary issues are prisoner well-being and staff-satisfaction). Equally the game attempted to engage with some of the inmates and the superintendent as people with particular behavior patterns and personal desires – which is admirable. Whether the intention of the designers or not – this game does put the player into the position that if they accept incarceration as the necessary outcome, what priorities would they place at the forefront of their management strategy: exactly the mindset, I would argue, that faced the most pragmatic and most stringent superintendents alike.